Costco announced association with GM that will allow Costco members to benefit when purchasing GM cars. Costco members can now receive the supplier price and a $500 gift card to Costco. Chevrolet, Cadillac, GMC and Buick are included. This limited time offer ends January 2, 2014. 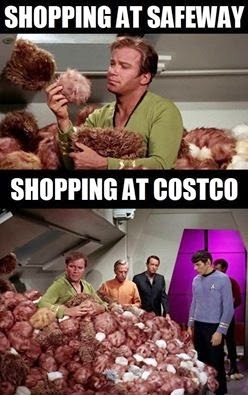 George Takei posted this poster referencing Costco on his very popular Facebook page, which has over 3,000,000 fans. The poster references the iconic "Trouble with Tribbles" Star Trek episode, in which the cute little tribbles reproduce uncontrollably. I've felt this way occasionally trying to find space for more Costco items in my tiny kitchen.